As fintech surges, Luxembourgers asset managers and servicing firms “are well-positioned to ensure that Luxembourg is in the driving seat for innovation,” according to Simon Ramos, partner of Deloitte Luxembourg. 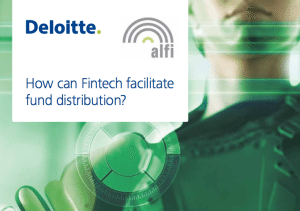 In a new paper entitled ‘How can fintech facilitate fund distribution,’ Deloitte Luxembourg and the Association of the Luxembourg Fund Industry (ALFI) explore Luxembourg’s vibrant fintech scene and further dive into the impact of new technologies on the distribution model of the asset management industry. With over 150 fintech companies based in Luxembourg, the domestic fintech scene has been flourishing, and new technologies, including blockchain, artificial intelligence, machine learning, digital investment platforms, and peer-to-peer lending, are quickly emerging. According to Denise Voss, chairman of ALFI, fintech will have a fundamental impact on the operating model of asset managers, distribution intermediaries and services providers. Fintech should not only allow the investment management ecosystem to increase in efficiency, it should also enable the industry to provide better customer experience and that, at a cheaper cost. “The asset management industry has a once-in-a-generation opportunity to re-imagine and modernize its distribution model to address market and operational challenges – for future and current investors,” Voss said in a statement. The new generation of investors will redefine the service level expected from asset managers by imposing more interaction with the brand, the report says. It notes that there is also a strong need for online and enhanced execution platforms. This includes market insight, wealth reporting as well as social investment interaction with peers. The report further dives into the key fintech innovation trends which are expected to redefine the industry. Machine learning will enhance prediction-based portfolio management techniques. Digital investment platforms and robo-advisors will become more and more popular, especially in execution-only-driven D2C. They will also enable a strong investor education about products and their related risks. Peer-to-peer lending is on its way to become an alternative asset class. Big data offers a lifetime opportunity for investment management actors to make use of and create value out of the enormous amount of information at their disposal. Possibilities include digital wealth reports, market intelligence, and peer comparison insights to the end investors. Nevertheless, the increased digital interaction on online platforms will increase cyber risk, a top priority for digital businesses. 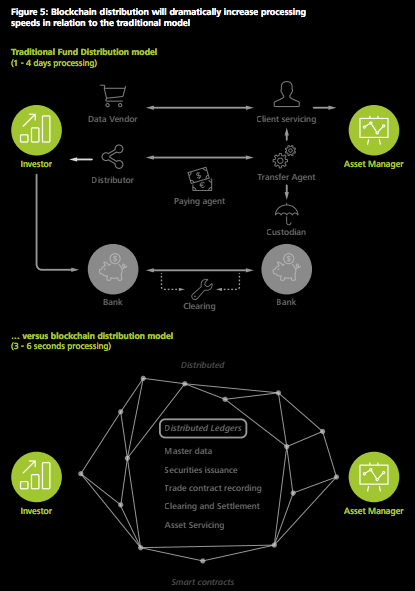 Asset servicing providers can leverage the benefits of blockchain technology to offer a cost efficient and automated asset-servicing model. The report urges Luxembourg actors to actively drive the fintech innovation locally, as well as engage with disruptors, modernizers, and enablers in order to be ahead of developments and avoid relying on innovation from abroad. The report advises for greater cooperation, calling for the investment management ecosystem to collectively explore initiatives in terms of enhanced online trading platforms, white label data analytics, managed services, regtech, blockchain or digital distribution passports. The organizations foresee further growth and tech developments in the sector. It predicts that in the near future, many more companies offering technological solutions streamlining the current operating model and addressing the needs of new generation of investors, will be entering the market. As fintech grows, so will competition. Hence, the report advises incumbent firms to adapt to this emerging trend. A possible strategy would be for them to develop their own technological solutions. They can also collaborate with fintech companies or even absorb them in their business model. This technological shift will be a challenge for incumbents but will also bring many opportunities. Featured image by Denphumi via Shutterstock.com.